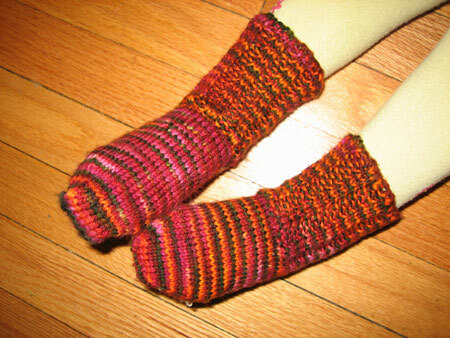 I finally got started on the March Sockamania sock; I am at row 25. This pattern has been a challenge for me because the stitch where you switch between dpns is a purl, and it is difficult for me to make these tight and I am worried about laddering. I thought about moving the stitches around on the needles, but then I lost my place too easily, so went back to purling the first stitch. Hopefully with practice my dpn technique will improve. This is my first project incorporating cables. 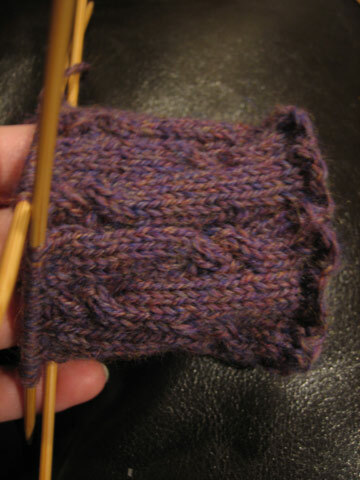 I’m not sure they look like the sample in the pattern, but I can tell that I am making cables! I’m using the 5th dpn from my set, which can be a little dangerous . . . in an absent-minded moment, I started knitting onto the “cable” needle, and suddenly had 4 needles in my work and it took me a few minutes to figure out what I had done! 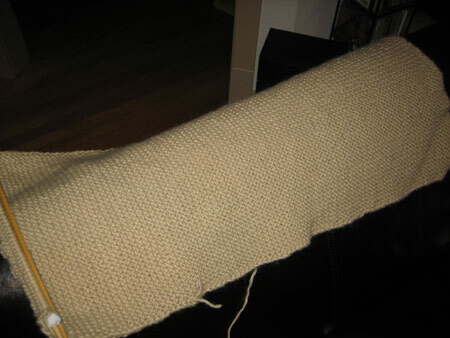 I’m almost done with the third skein, and the bottom panel is now about 30 inches long. A lot of work, and not too exciting yet. I can’t wait to start knitting in a different direction! 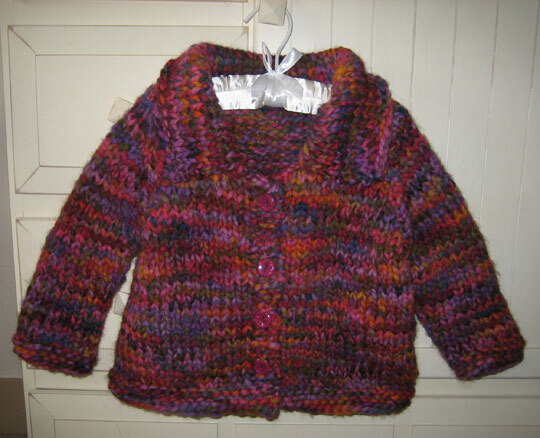 Remember how I ran out of yarn before I finished my first Toddler sweater? Well, I found the right colorway on eBay. Not the same dye-lot, but it doesn’t seem to matter in this case, so now the sweater is perfect! And now I need to find something to do with the 80% of the skein that is left . . . I know, I know . 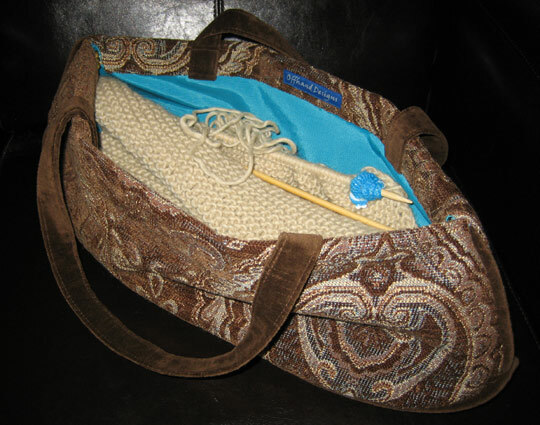 . . you don’t really need a special bag to carry your knitting. I have been carrying my knitting around the house in a basket, and taking my sock projects in a tote bag so I can work on them while waiting to pick up my children from dance class or school. 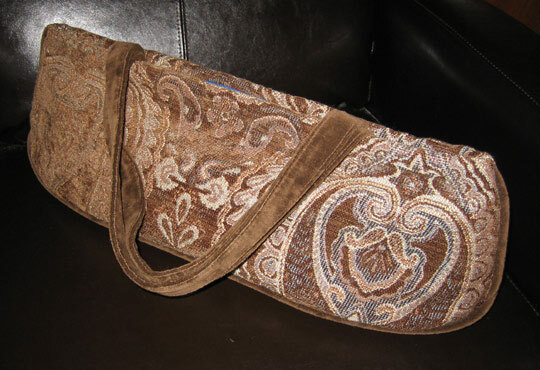 But, there is just something nice about having a special bag for your special project. One that doesn’t require you to scrunch up your work, or risk snapping your needles. One that has a pocket for everything. I found one I am very happy with! I bought this Zelda Grand by Offhand Designs from my LYS (local yarn store) for $150. A bit pricey, but it is handmade in the USA, and sometimes you splurge when you fall in love. At 22″ x 7″ x 6″, this bag is just right for holding my Einstein jacket in it’s current state; it definitely isn’t deep enough for a big project like an afghan, but I don’t have any immediate plans to start something large, so for me it is perfect. You can open the bag and instantly see everything inside, and the hinged top will remain open on its own so you can leave your working yarn in the bag and work right from it. The bottom of the bag is flat and has feet, so you can sit the bag on the floor or other surface. I love the beautiful exterior fabric, and the turquoise lining as well. There are little pockets inside, not really visible in my pictures, which can hold your tape measure and other small notions. The only drawback to the bag is that a pattern book or 8 1/2″ x 10″ sheet of paper will not fit inside without folding or rolling. I know this is old news to anyone conducting genealogical research; the trouble with transcribing names written in elaborate handwriting in a census or other source, or even worse—-relying on a printed index based on someone else’s transcriptions! But in my family, there is one specific ancestor who was a victim of mis-transcription so frequently, I thought it was worth a post. Maybe even a laugh, now that the frustration has worn off. The ancestor is George Thornton Golden, and the “T” is the culprit. Obituary listed as George “F” (but luckily indexed as George “T” by the library). The obituary brings us back to his father, Jesse. 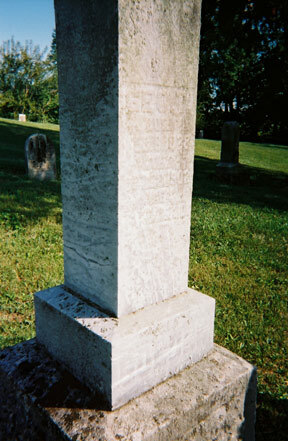 His tombstone, next to that of Jesse, says “Geo T”, with “Julie” on the other side. Unfortunately I don’t have a better picture of this stone—I will need to try to get one. 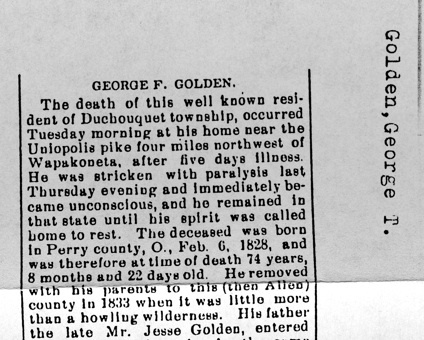 He is named as “G.T.” in his father’s obituary, not named in his mother’s. So, we don’t have a single source that states his full name as George Thornton! His full name has to be inferred from the various sources. 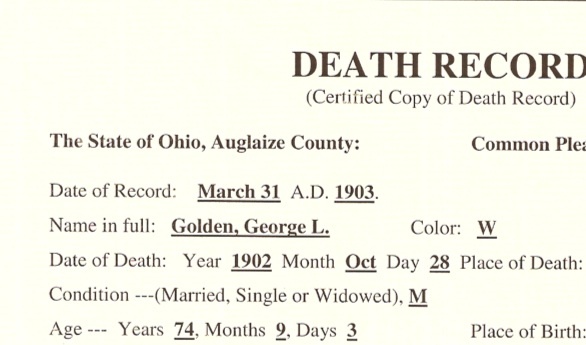 Luckily, he and Julia had 8 children, which helps in aligning the census records, in addition to the fact that there are no other George Goldens in Ohio of his age, and no other George Goldens in Auglaize County. The moral of the story—don’t trust everything you read! 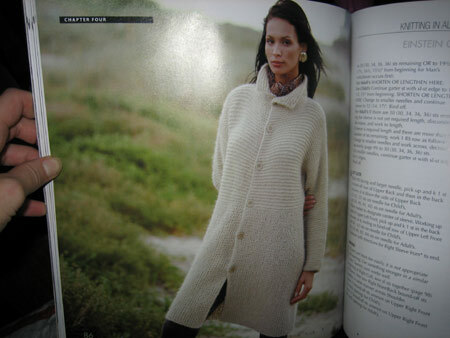 Now I’m starting on a huge project; the Einstein coat from book one of The Knitting Experience by Sally Melville. It has taken me about 6 hours to get this approximately 17″ x 9″ piece of the bottom “skirt”. 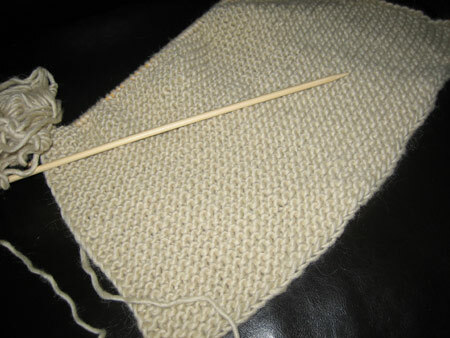 So, I figure I have at least 48 hours of knitting to go (yikes). This is an especially good project to do while watching TV; I’m working on it while trying to catch up on Lost.